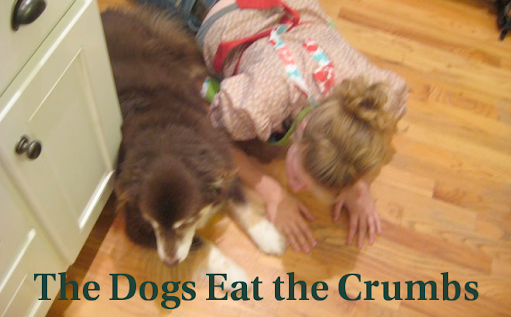 The Dogs Eat the Crumbs: Introducing: Simple Soup Supper! If it is eaten with a spoon, chances are I'll love it. Cereal (hot or cold), pudding, applesauce, soup. Especially soup. Hot, cold, delicate or hearty, I really enjoy soup. We eat our evening meal pretty late - between 7:30 and 8:00 typically - and at that hour simple fare suits us best. Soup often fits the bill, typically accompanied by a big salad and some bread. In honor of my favorite type of meal, I'm adding a new event to my blog: Simple Soup Supper. I asked my daughter A.L.E. to design a logo, and I'm sure you'll agree she did a great job (mmm, tomato soup, my favorite! - with water, not milk). My plan is to cook a soup recipe - a new one or an old favorite - a couple of times per month, posting the result on my blog. I'm looking forward to many soup-er experiments! For simplicity of cataloging, I'll feature the first soup in a separate post. I've also gone back and tagged my previous soup posts as "Simple Soup Suppers." 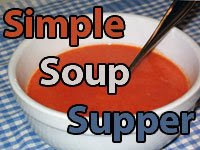 You're welcome to play along with your own Simple Soup Supper - feel free to use the logo. Like Clara with Cooking Light Night, I'd request that you link back to my blog in your post so I can see what you're cooking up! What a great idea! I try for three years now to blog the "Suppe der Woche" - Soup of the week. Unfortunately I never got 52, but this year I have already 13 different soups, for every month a new one. Any news about brown sugar in Germany? That sounds fun! I love soup and will be joining you. I have tagged a bunch of soup recipes to try as well. This is the perfect excuse to break them out. it's my soup blog, which I am horribly lazy with, but I linked to you. I think you will inspire me. Hey Nancy...check this out. Thanks for the use of the logo!